Life in Iridiscence: "Code Geass R2", "Twilight" and "Midnight Sun" : Review , Spoilers and Obsession over Lelouch and Edward. There's something about their irises. "Code Geass R2", "Twilight" and "Midnight Sun" : Review , Spoilers and Obsession over Lelouch and Edward. There's something about their irises. The second season of "Code Geass: Lelouch of the Rebellion R2" begins one year after the rebellion in the story and in the final culmination the story ends here as well. This is now one of my top favorite animes of all time (I should make another entry about this). I've read somewhere the reason it appeals to everyone is that they were able to catch all the market (or fetishes) by offering all the necessary elements. It has mecha and lots of physical action and mental tactics for the shonen audience. It has just the right romantic undertones that can make the shojo fans active imaginations to run wild. And lastly, the collaboration with character designs with Clamp, catered to all fanboys and fangirls fantasies. Personally I was hooked by all the cliffhanger episodes and the twist of the first season. After every episode of R2 I was always left with my jaw hanging open or saying OMG or WTF! Especially the episode where Zero became the emperor and Suzaku became Knight of Zero. 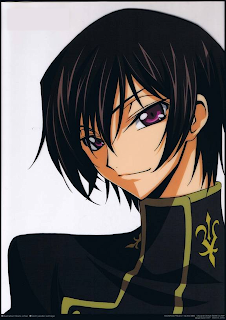 But as I've watched this season I started to fall for Lelouch. He's the anti-hero who has a consience. He's very brilliant and he makes all the hard choices for the sake of Nunally and eventually the greater good. Such a tragic character and to think he's just a highschool kid. I cried over the last episode! The scene with the haunting music and everybody was in slow motion as Zero is about to kill Lulu. But just like Dumbledore-is-not-dead debacle before there's a lot of speculations in the very last scene if CC is talking with Lulu or herself. Check this page for more theories. My take for this is that yes he's alive. Aside from all the logical evidences provided by some I think Sunrise intended an ending that will make people to think and to hope. It will be boring if it was just they live happily ever after. In a true "Code Geass" fashion they ended in a bang messing people's mind if he's dead or not. I wish they create a movie like what "Full Metal Alchemist" did to kick all Lulu's detractors. After feeling raw, sad and in denial but fulfilled from watching the finale I never thought I'll found an antidote or well another addiction all in the same day. I finished "Twilight". All of this happened last September 29 and I only felt like I'm ready to pour out of all this after re-reading "Twilight" and yes I'm about to re-read the other three. Can't you believe after all these years I still haven't reread "Harry Potter" series? Bella moved in to her Dad from sunny Arizona to rainy small town Forks, Washington as a self-imposed exile all for her mom's new life and happiness. She becomes dazzled by the pale-faced topaz-eyed bronze-haired boy who's actually a vampire. She first caught his attention because he can't seem to read her mind and then found her the most intoxicating food-to-be in his entire eighty years as a vampire. It's a forbidden love story about vampire and mortal, predator and prey, lion and lamb...ooh I love the polarities. I was very nonchalant when I started reading the book. I keep comparing it to Rowling's and Marquez' literary style. But after finishing everything I can say she hit bullseye in the hearts of teenage girls and teenage-girl-at-heart. This is THE love story of this generation and time. The negative reviews are for people who are numb to their feelings. I mean I agree the plot has some weak points but at the end of the day it had left me changed to a hopeless romantic fan. The high and mighty elitist can pick their own noses. I'm so crazy about everything about "Twilight". I highly recommend reading the partial draft of "Midnight Sun" which is "Twilight" from Edward's point of view. You would understand him better and get a kick of the smallest details. It will discredit the critics who are saying that their love is purely based on magic. I have a nagging feeling that the leaked draft is a marketing ploy to heighten the entire franchise especially the movie because it stops right exactly before the meadow scene. I'm also wondering how Rosalie and Emmett and Jasper and Alice were able to pass of as siblings and especially at the prom. And what do they do will all the corpses of the animals? Some hikers will eventually find all the drained animals. I only watched the trailer after I read the first book so I won't have any idea or prejudices. Robert Pattison and Kristen Stewart are perfect for the roles. I've finished the saga in less than two weeks. I would have finished it sooner if I have all the time in the world and if "Eclipse" wasn't painfully out of stock. I scoured and called up all the bookstores for the elusive copy. I even tried to look for leads of people reading the book until against my will I've read the e-book. I swear I will complete the collection. I've already marked my calendars for the soundtrack release and I'm like a walking movie countdown widget. I'm contemplating if I should join a local radio station contest or not (listening to them like 24/7) to catch the premier a day before the worldwide release since I'll have to file a leave for work and sacrifice a day allotted for Christmas break. It's very tempting to join since the premier will be like technically two days ahead the U.S. release. I watch the final trailers almost once or twice everyday and lurk at all "Twilight "official and fan pages and of course anything related to Edward Cullen and Robert Pattison. I am willing to invest money to ensure it becomes a blockbuster and secure a franchise from Summit and for Meyer to be inspired to finish the leaked draft. I'm kind of disappointed that they need to plug it as action-packed and build a superhero/bad guy image to attract the male viewers. They're afraid it will flop with just girls as viewers. I'm going to be furious if they take away all the romantic scenes in favor of action! I clearly remembered watching "Romeo+Juliet" in highschool and I can't understand their dialogues at all because everytime Leonardo pops out all the girls would just scream. I'm kinda afraid that will happen at all Edwards scenes and that I'be one of them too. Utterly and irrevocably in love with Edward. Sigh! Meyer wrote this book after dreaming of a vampire and a girl. Another reason why I'm such a fan as well as I had an exact dream like this years and years ago! I can't remember when but the vampire was like a really bad guy but he fell for me and he's trying not to bite me. But in that dream I can't see the face. I've been partial to vampries cult like "Bram Stoker's Dracula", Anne Rice's novels and movie versions, anime "Blood+" and my manga favorite "Vampire Knight". Prior to discovering "Twilight" I was waiting for "Vampire Knight Guilty" and watching HBO TV series "True Blood". After watching "True Blood" my husband posed a question what will happen if Sookie has her period. It also dawned to me that in "Twilight" it was only discussed once and it was on Book 4. So I'm wondering how does Edward handles that every month and the entire Cullens when they're at school plagued with teenage girls. I hope it will be covered in "Midnight Sun". If you're a fan of both then you'd know that their irises are both essential in the stories. Lulu or Zero has the power of Geass in his eyes while Edward's eyes changes colors if he's thirsty or well-fed.